In 1957, Aeronutronic Systems built the Farside (sometimes spelled Far Side) research rocket under contract from the USAF's Office of Scientific Research. The goal of Project Farside was to send a small scientific payload to an altitude as high as possible with then existing solid-propellant rocket technology. The altitude goal was tentatively set at 6400 km (4000 miles). The Farside rocket was a four-stage vehicle using existing solid-propellant motors. The first stage consisted of four Thiokol Recruit rockets, the second stage used a single Recruit, the third stage used four Grand Central Arrow II motors (a development of the Loki), and the fourth stage was a single Arrow II. For an initial boost in altitude, the whole rocket was carried aloft by a very large (106000 m3 (3750000 cu.ft)) balloon. Farside was suspended in vertical attitude in an aluminum structure below the balloon, and at an altitude of 30 km (19 miles), it was fired straight through the balloon. The first two stages were stabilized by aerodynamic fins, while the 3rd and 4th stage were spin-stabilized. After burnout of the final stage, the nose cone had reached a speed of almost 29000 km/h (18000 mph) at 122 km (76 miles) altitude. The payload weighed about 1.4-3.3 kg (3-5 lb), and could obtain and transmit data on particle and electromagnetic radiation, the magnetic field, and interplanetary gases and dust. A total of six Farside rockets were fired from Eniwetok in late 1957. The first launch was attempted on 25 September 1957, but failed due to a balloon malfunction. The next three launches in early October were also unsuccessful, because one or more rocket stages failed to ignite. 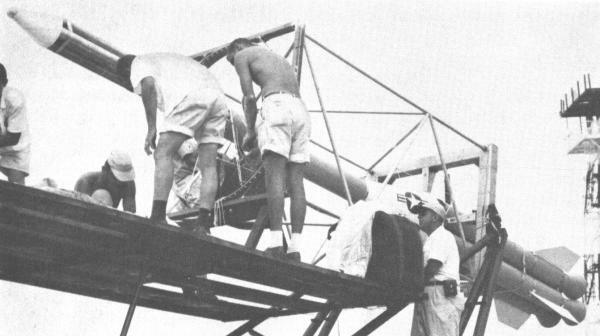 The 5th and 6th Farside rockets on 20 and 22 October were the only ones to come close to the design altitude, but because of transmitter failures no scientfic data was obtained. These telemetry failures also prevented accurate tracking, and therefore no exact data on the peak altitude is available. Sources quote values between 3200 and 5000 km (2000 - 3100 miles). A secondary goal of Farside was to test concepts for a larger five-stage follow-on vehicle, which was to reach the vicinity of the moon. However, this project never materialized.